When you want the services of a certain business or individual, you will need to get into an agreement and sign a contract with them. The contract serves as proof of their transaction and makes both parties accountable for each other. One of the services that people hire during parties or certain events are DJ services. 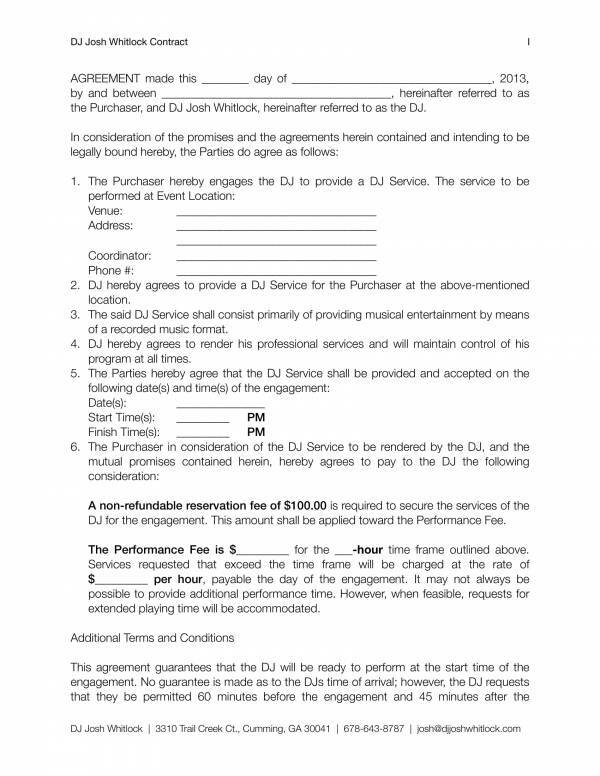 In this article, we will be learning about DJ services contract. Here, we will define what it is, enumerate its uses, understand why it is important, how to be able to make one, and know the advantages of using contract templates. You may also take a look at and download the samples contract templates that we have provided in this article. 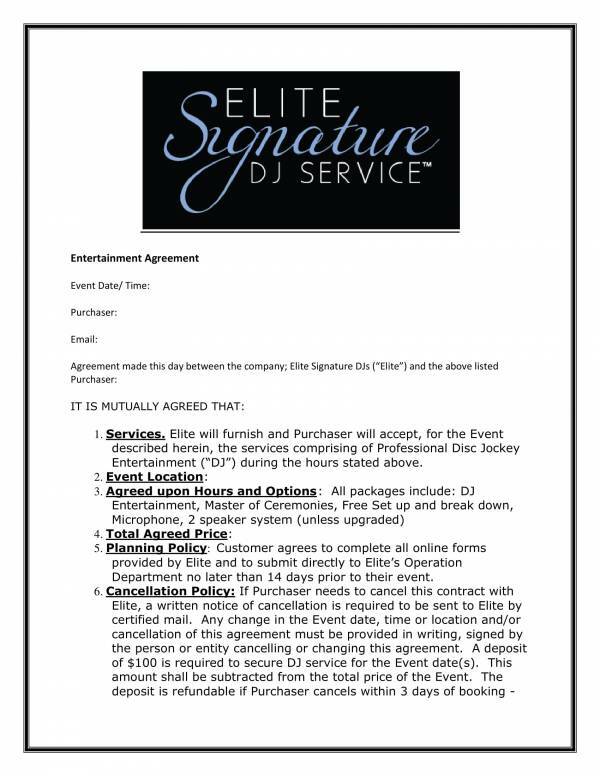 What Is a DJ Service Contract? A DJ or a disk jockey is an individual offering professional services in the music industry. DJs play music just like most musicians. DJ services are in demand in parties and a lot of events as their music they play hypes up the crowd and keeps the party going. Every DJ has their own style of music. The music DJs mostly play are upbeat music, popular party songs and a mix of all other types of music. DJs are often seen on stage working on large disks that allows them to manipulate music and create just the right beat and tune of their liking. DJs are also seen wearing headphones when they perform so that they can hear and appreciate music better. While the job looks easy and mixing music may seem like just playing with large discs, the job actually requires skills, talent and a lot of practice to be able to come up with a music mix that crowds of people will truly enjoy. Since professional DJs have become in demand in a lot of parties and most events, it has become a profession and people can now hire DJ services for a certain fee. 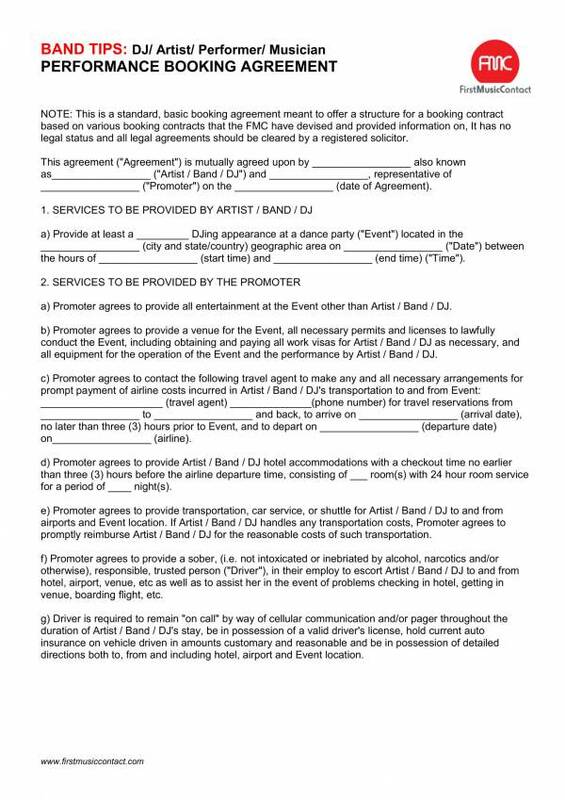 To hire the services of a DJ, one must be able to get a booking and sign a DJ services contract? What exactly is this contract for? The contract is used when both DJ and customer reach an agreement about the same terms and conditions at exactly the same time and place. 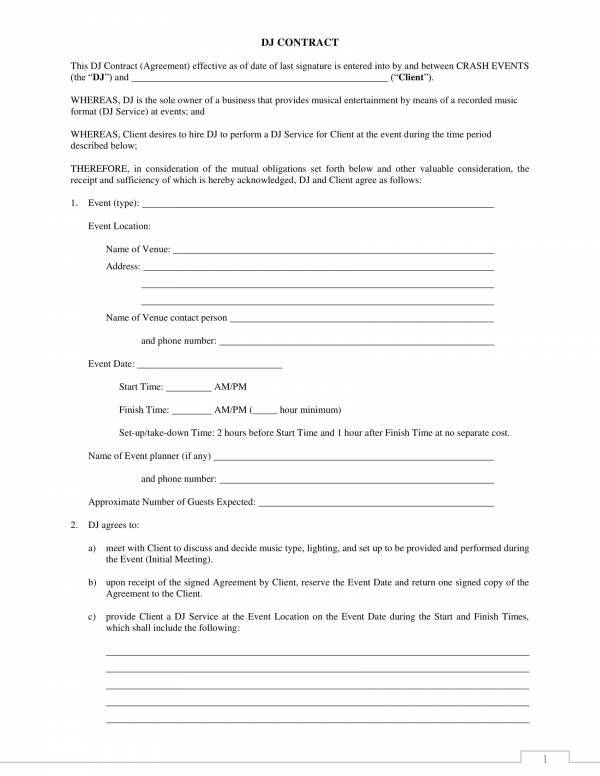 Some of the provisions in a contract, include the date when the DJ is expected to perform, the location, the DJ’s talent fee or rate per hour, who will shoulder the accommodation and fare, and specific limitations for each party. The contract is used to bind the parties involved to all of the provisions stated in the contract. This is so ensure that both parties will oblige to what has been agreed on, as well as show their commitment to the contract. The contract specifies what both parties must do and must not do while under the contract. Here, the contract is used as a reference of everything has been discussed and agreed on with the said transaction. 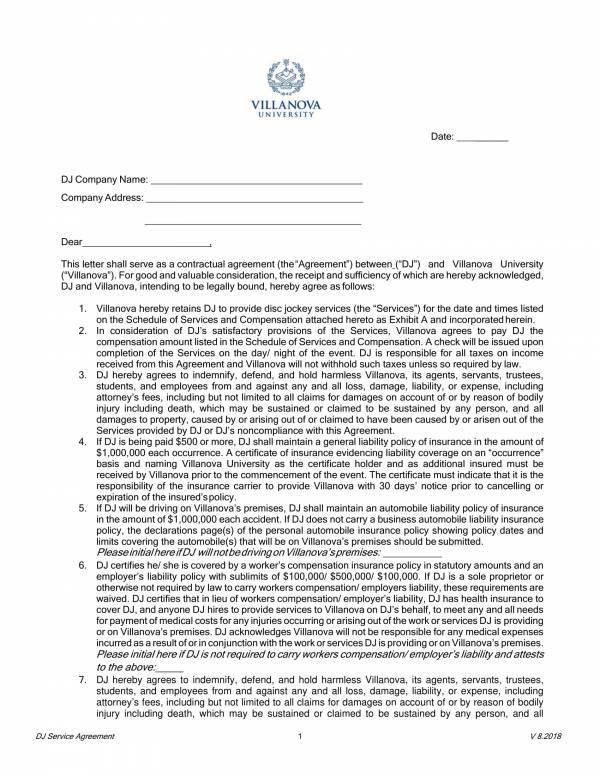 The contract document is used as proof that the transaction between the DJ and customer took place and that they have agreed on something the same. The contract also serves as a written consent given by both parties that thy have entered the contract with their own free will and that they were not forced to enter into the contract. The contract is used to specify the duties and responsibilities of the parties involved in the contract. The duties and responsibilities of the DJ and the customer are provided separately. 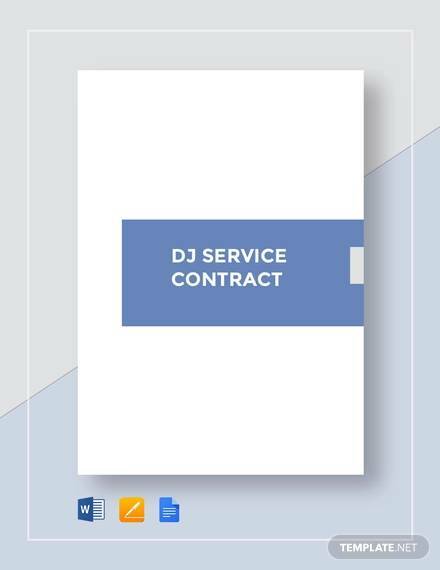 Because contracts may sometimes be lengthy and are often always repetitive, DJ services contract templates are used to make the process of hiring DJ services easier and more convenient for both parties. You can find other contract templates on our website that you may use for free. 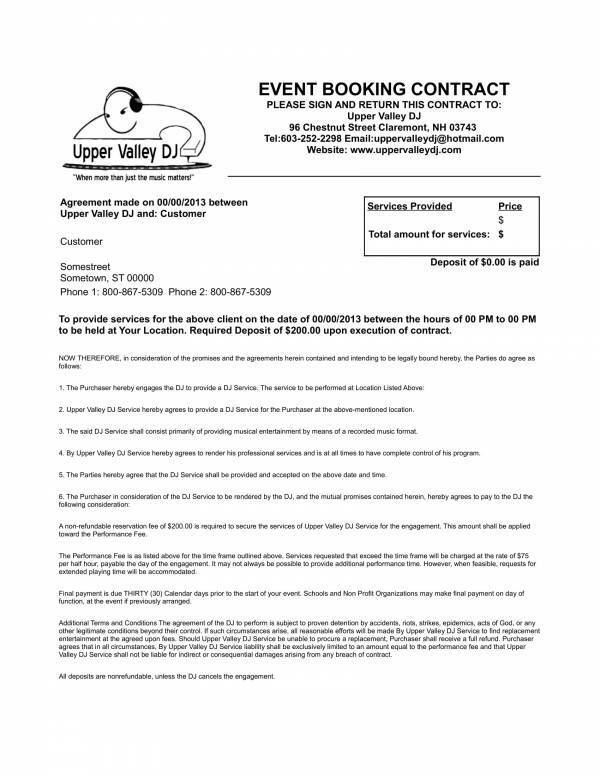 Some examples are DJ Contract Samples, Music Band Contract Template, and Photography Contract Templates. Business and legal transactions require certain documents and of them is a contract. Why is this so? Why is a contract necessary when it comes.to these transactions? One of the main reasons why contracts are necessary is because they are legally binding documents. As a legally binding document, it ensures that both parties involved in the contract are not only committed to the contract through promises but they are bound to everything in the contract with a written document that is enforceable in the court of law. This means that both parties are obliged to go to court if the need arises. Well, if you are bound by this type of document, then you would think twice of actually breaking your sworn, witnessed and signed promise. Since contracts are also written documents, they make very reliable proof of transaction that can be used as evidence in court proceedings. This is possible if the contract has been written correctly ans has followed legal formalities. Contract documents must be detailed and must include everything that the parties have agreed on. There should never be any hidden information or secret behind a contract, or else it may be deemed invalid. So when issues or misunderstanding about a contract takes place, the document is used as a reference or is consulted and reviewed to clear any misunderstanding. This can be easily done because both parties in the contract are provided with their own signed original copy that has been reviewed by both parties before the contract signing. Now, if you would be conducting business with another business, perhaps a partnership, you would want to feel secure about the transaction you are getting yourself into. You could easily be tricked into something or the other party might just run away once they get hat they want. There is actually no need for you to invest in any emotions or feelings here because they are not necessary. Contracts provide security for both parties involved, and we are not even talking about security guards. The contract protects the parties involved from fraud and any other bad plans that the other party may have against them. Also, if the other party tries to run away form their responsibilities, the law will be running after them or will be pursuing them to let them pay for their crimes. Aside from security, contracts also protect confidential and proprietary information from further disclosure to individuals and entities who should not know anything about it. The confidentiality clause in a contract specifically defines confidential and proprietary information in the contract, and prohibits the parties involved from sharing this information and using the information to their advantage. Issues with payment are avoided with the use of the contract. It is because the contract includes a separate section that covers everything about the payment term and conditions. The details include, the total amount to be paid, mode of payment, payment frequency, payment dates or schedule, taxes, fees and who will be taking care of all other expenses. Contracts also makes it possible for any issues or problems to be resolved without having to pay for very expensive and costly litigation. A list of the contract breaches as well as their corresponding remedies are enumerated in the contract, as agreed by the parties involved. The remedies for the contract breaches is first consulted and used when issues arise. This is where the participating parties make arrangements to deal with the issue at hand. If the issue gets settles, then there is no need to go to court. But if the both parties have not reached an agreement or settlement, then case will be brought to court for litigation. Can you think of any other way to conduct business or any forms of transaction that can make you feel secure and protected aside from a contract? It’s definitely hard to think of other possible ways that is why contracts are given such importance. Other relate articles that you may find useful are Event Contract Templates, Band Contract Template, and Videography Contract Templates. 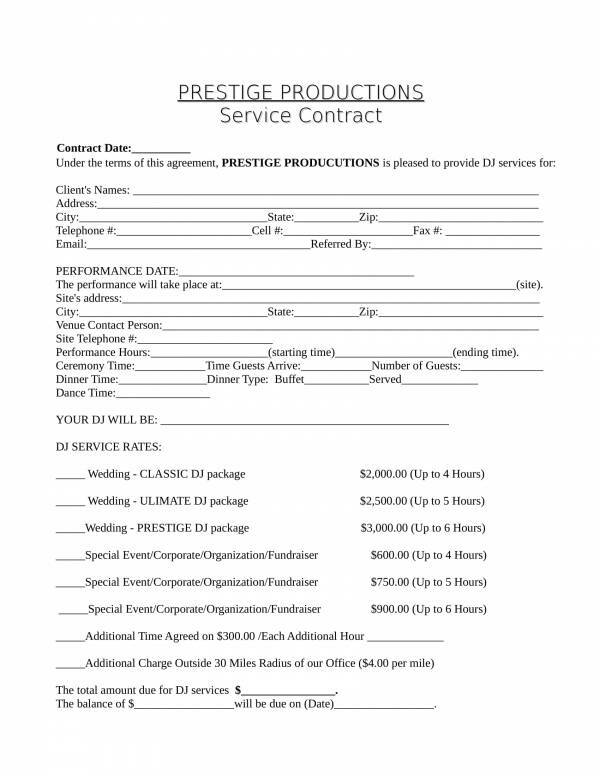 Making a DJ services contract is something that you think would be impossible or very difficult for you to do. y Contracts are never easy to make that is why a lot of people thin that only professionals will be able to o the task. Truth is, there is a way to easily make a contract and feel confident about it. 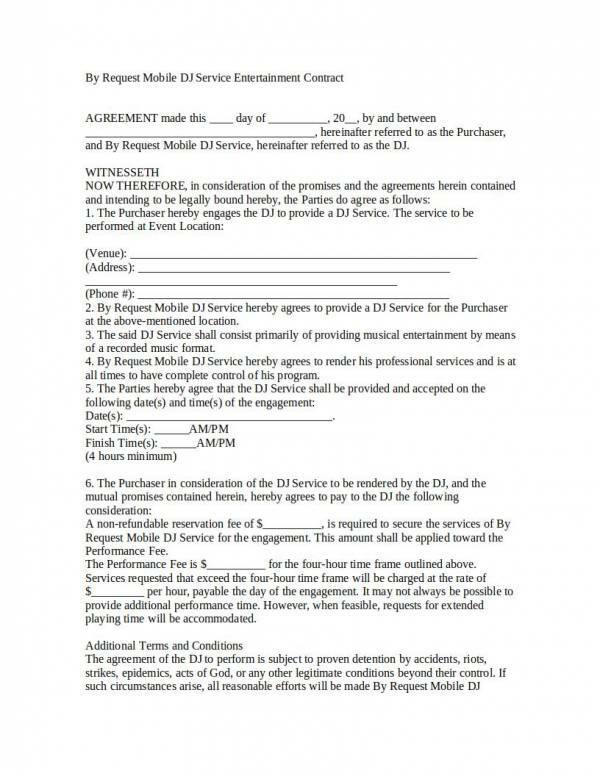 Here, we will provide you with simple steps on how you ca create your very own DJ services contract. 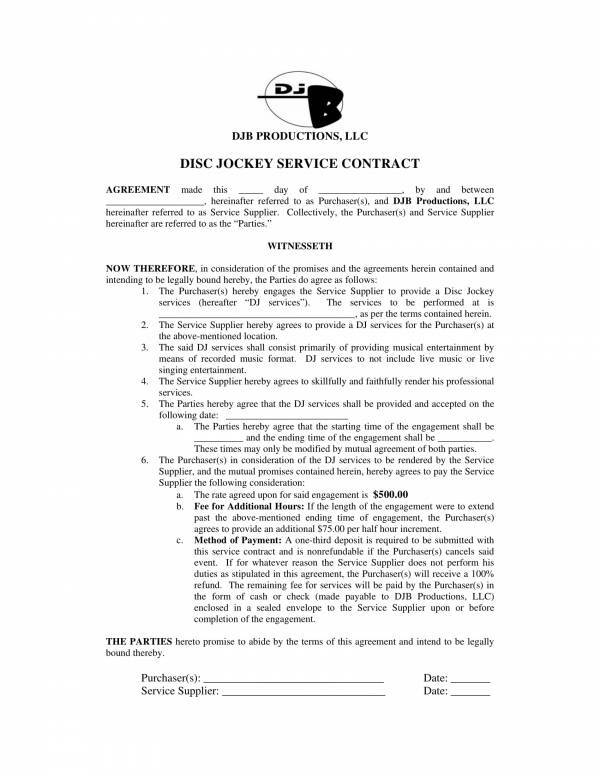 The very first thing that you will need is a DJ services contract template. Yes, you read it right. In order for you to be able to create your own contract easily, you will need a contract template. There are many websites offering free contract templates that you can download and use as your own so finding one should not be so much of a problem. You may also check out the sample template that we have included in this article. Once you have selected the right contract template, download the file, have it saved in your preferred folder and then launch the application to open it. Next, carefully read the details of the contract template that you have selected. This is so that you can make sure that the contents of the contract exactly what you need. If it isn’t, then try to look for another contract template until you find that one contract that you think you can use. After reading or scanning through the entire document, you will already have an idea of its contents, what deals to change and what information are needed to fill in the required fields. Gather the information that you will need to fill in the required fields of the contract template and make a draft or list of the other details that you will need to change. When you have the details ready including the changes that you want to make, start working on the template that you have selected. You can enter the required information in their appropriate fields first and then make the necessary changes to the template, or make the necessary changes first and then and then enter the required information, or you can do both as you go over the template. Just make sure that you don’t confuse yourself in the process. If you are done entering data and making the necessary changes, go over your work once or twice. Review the changes that you have made and see to it that your content is still coherent and related. Also check for any spelling and grammar errors that you may have overlooked while adding the details. It is important to keep your contract template error free and coherent. This will affect the credibility of the document you just created and may seem unreliable if errors are not fixed. Save the changes that you have made and proceed with printing enough copies needed for the transaction. 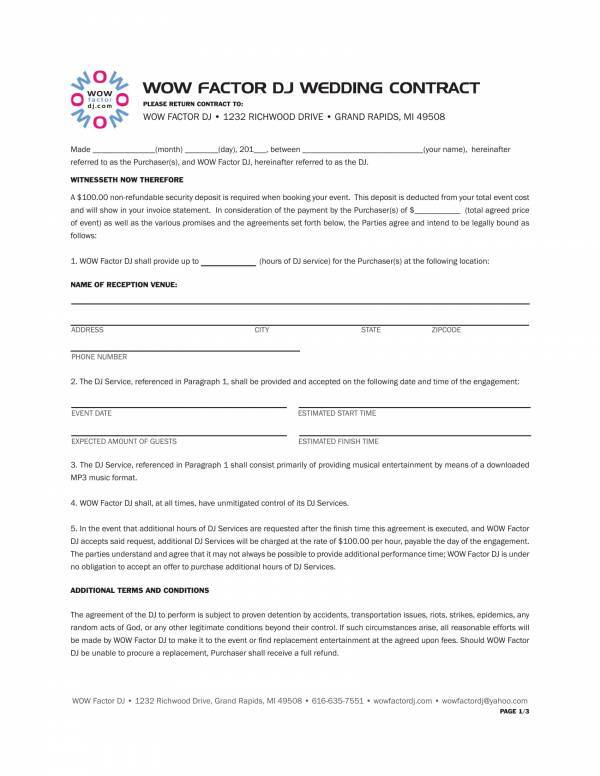 With the help of DJ services contract templates and other available contract templates, making your own contract is no longer impossible and is definitely not difficult. Who says only professionals can handle this task? If you need more contract templates in different varieties, you surely can find a collection of them on our website. 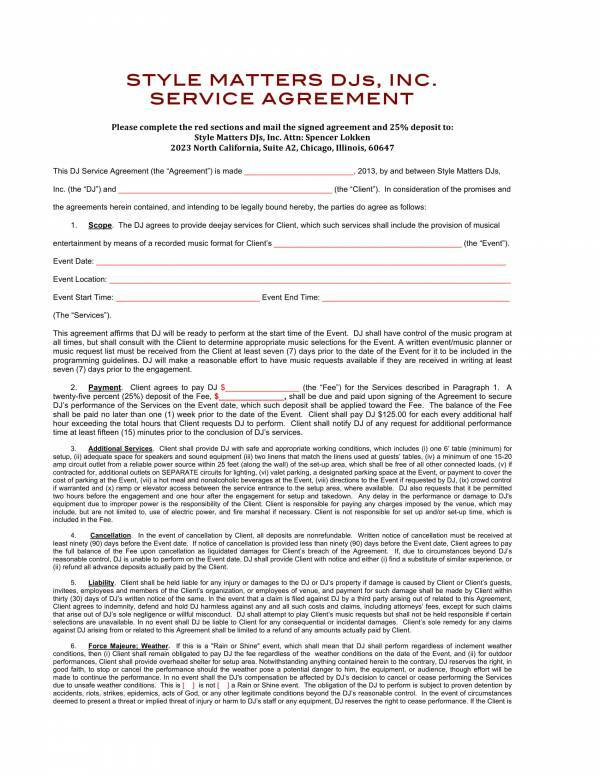 You can check out articles, like Service Contract Samples and Templates, Simple Investment Contract Template, and Online Advertising Contract Template.